We'd just concluded our Catan 2011 tournament at MAGACON last Saturday and while I'm still trying to catch up with the sessreps, one of the pictures of MAGACON uploaded to the KDU University College Facebook page caught my eye! Picture Â© 2011 courtesy of KDU University College. Used with permission. It's the perfect freeze frame! Henry (white tee) and Richard (red tee) pointing their fingers at poor Jonathan (blue BGC Retreat 2011 tee, yay!) while Kean Chong (gray tee) sniggered. 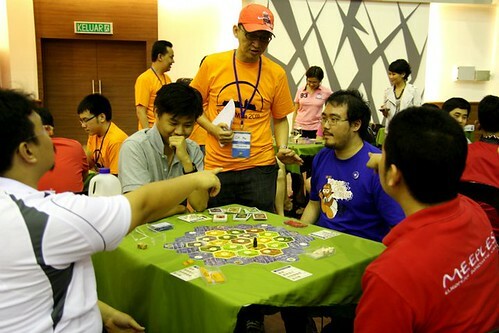 Looking on's CK Au in the orange BGC Catan Msia 2011 tee. 1. You may submit as many entries as you wish but ONLY THE LATEST entry counts as your submission. 2. No entry fee to join. Just be creative and send your caption to events@boardgamecafe.net with the subject line "BGC Christmas Caption Contest 2011" or just click on this link. 3. You may send your entry in simple text form or you can do one up with text bubbles. Hint: aycee's caption is well illustrated. 6. The panel of judges would comprise of CK, aanemesis, waiyan and some Inner Circle members (obviously only those members not taking part in this contest would be picked as judges). Decision of this panel is final. Once we've selected the winner, we'll post up some of the better captions we received so you may yet get your 15-min of fame. http://community.boardgamecafe.net/public/style_emoticons/<#EMO_DIR#>/tongue.gif' class='bbc_emoticon' alt=' ' /> If we get really good runners-up, we may throw in additional prizes. If you've any question, pls post them here. Let your creative juice run wild! And feel free to share this with your friends!! P/s Come on, let's give aycee a run for his money! I'll track here the entries I've received (not the details, just the name of the sender).